These healthy double chocolate bran muffins are about to turn your world upside down. Miles away from the dry, crumbly bran muffins you've had in the past. These babies are super light, crazy moist and so unbelievably yummy that you'll never believe they're good for you. 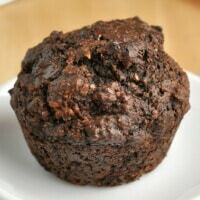 Whoever said breakfast muffins are empty-calorie frostingless-cupcakes has never tried my chocolate bran muffins! Preheat the oven to 400F/200C and grease a six-mould muffin or cupcake tin. In a large bowl, stir all the ingredients together thoroughly, until everything is totally combined and there are no dry pockets. Scoop the batter into the greased muffin tin moulds and bake in the preheated oven for 15 minutes. Leave the muffins to cool on a wire rack before eating or storing. Store these muffins inside an airtight container or Ziploc bag in the fridge for up to 5 days or in the freezer for up to 6 months.